I invited friends for the annual New Year's Day brunch. I prepare traditional open sandwiches with a twist on this occasion. This year I developed some brand new varieties. Here are what I served for my guests. This sandwich is based on the classic Danish open sandwich where bacon, pickled cucumber, bacon and aspic are basic ingredients. Instead of button mushrooms, I have upgraded the open sandwiches to hold fried porcinis and truffle oil is added to the aspic for that extra special aroma. Fry the bacon in the oven until golden and crisp. Dry on kitchen paper to remove excess fat. Prepare aspic by dissolving 1/2 packet of aspic powder in hot water adding truffle oil. Cool down in refrigerator until set. Place three slices of paté on each slice of rye bread. 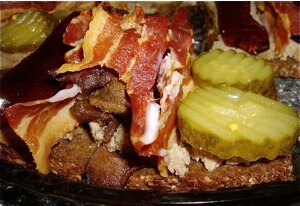 Place 1/2 slice of crispy bacon on each side of the middle piece of paté. Fill fried porcini mushroom between the bacon and truffle aspic and pickled cucumber on each of the other pieces of paté. 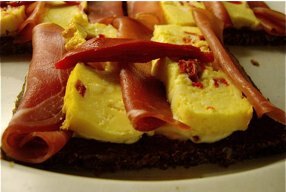 This open sandwich is based on the smoked and cured ham and scrambles eggs variety often served in Norway. The Dijon mayonnaise is a delicious contrast to the neutral but rich egg terrine. Spread mustard mayonnaise on the rye bread. Fold the ham twice until their form small rolls. Place ham and egg terrine on bread. Garnish with red peppers. The Danes make their Skagenrøre mixing mayonnaise, raw onions and fish roe with freshly peeled prawns. The garlic and thai chili sauce adds even more contrasts to the salad, but be aware that too much of these ingredients may overwhelm the fresh taste of the delicious fresh prawns. Allow mayonnaise to set in refrigerator overnight. 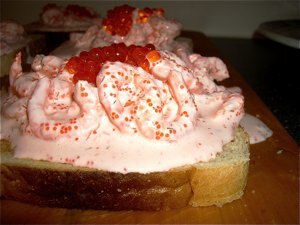 Do not add fish roe before assembling the sandwiches. Toast 5 slices fine French loaf. Mix 300 grams peeled prawns with the mayonnaise, then add fish roe. Place on bread 10-15 minutes before serving in order for the bread not to turn soggy. In Norway open salmon sandwiches are served on scrambled eggs. I am inspired by the Jewish bagels with cream cheese and lox served in many delis in the US. 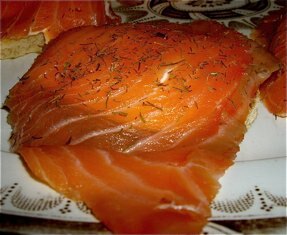 Why not add salmon to cheese as well as the topping for double delicacy. Mix cream cheese and sour cream well. Place in a blender, and add smoked salmon and blend it all into a fine cream. Check in order to add more salt, then add tomato ketchup for colour and sweetness. Toast 5 slices fine French loaf. Place salmon mousse on bread 10-15 minutes before serving in order for the bread not to turn soggy. Cover cream and bread completely with smoked salmon. Pour 1 cl akvavit over each slice of bread.